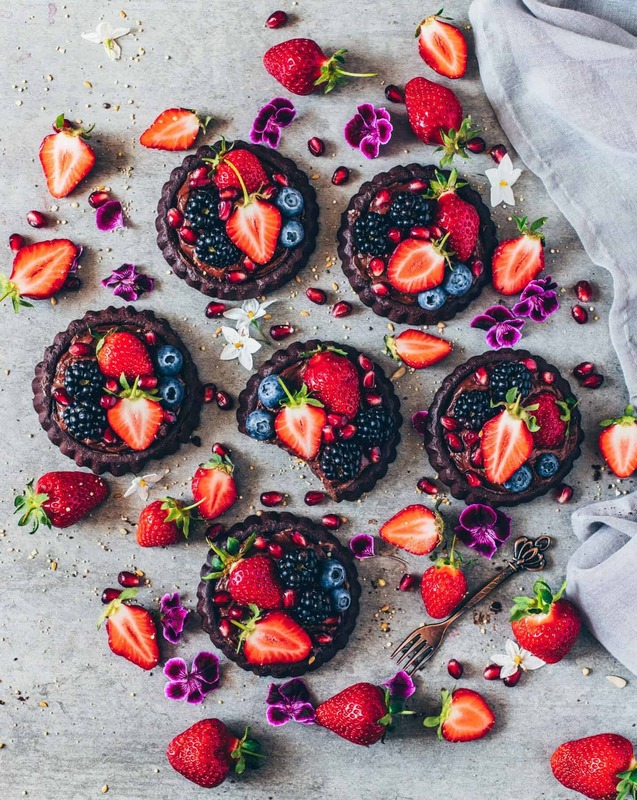 Easy vegan chocolate tartlets with creamy, healthy avocado-chocolate pudding and fresh berries. 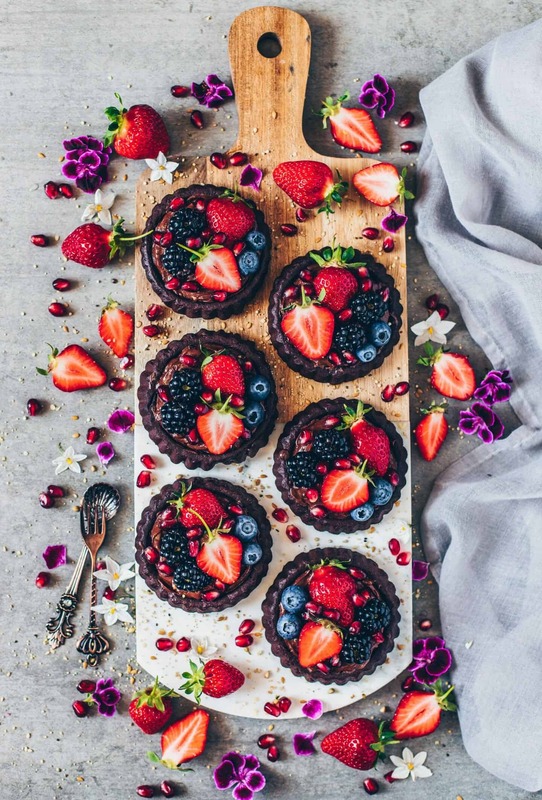 A perfect recipe for all chocolate and berry lovers. Especially when the tarts come fresh chilled out of the fridge, it’s a great summer dessert. Since there is already a chocolate mousse recipe with tofu on my blog (-> ‘Vegan mousse au chocolate‘), I’ve tried a few other variations this time. I liked the version with avocado best. Maybe that sounds a bit strange, but it really tastes great! Avocados are not only very healthy, but also naturally sweet in taste, super creamy and so tasty. You can combine them perfectly with other fruits, such as bananas. These also ensure a natural sweetness and a creamy consistency. 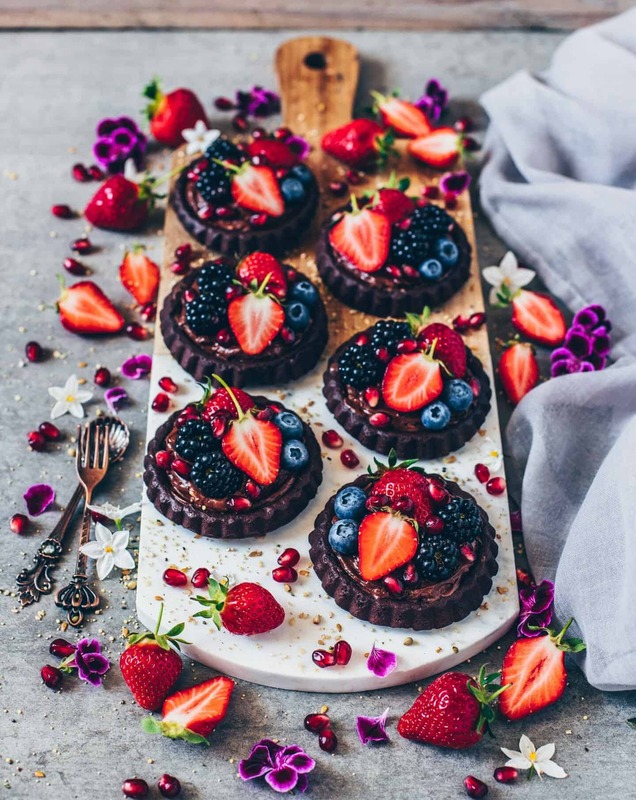 Served chilled and topped with a few fresh berries, this creamy “avocado mousse” simply tastes heavenly and is a perfect healthy vegan dessert. 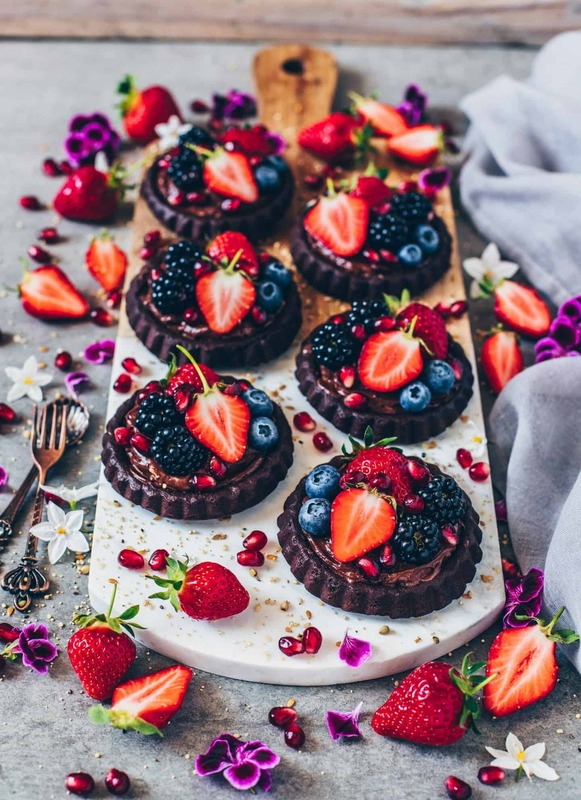 If you want to enjoy these small tarts in the afternoon, you should bake the tartlets already in the morning, as they can then cool until afternoon. The dough is also very easy to prepare. It’s just made of light spelt flour, vegan butter, cocoa powder, powdered sugar, some soy milk and a pinch of vanilla. Instead of vegan butter, you can also use plantbased margarine or coconut oil. With wheat flour instead of spelt flour and another plantbased milk alternative, such as almond milk, the short crust also works, of course. By the way, remember to grease the tartlet molds with some oil before filling them, so that you can remove the tartlets from the mold easily after baking. 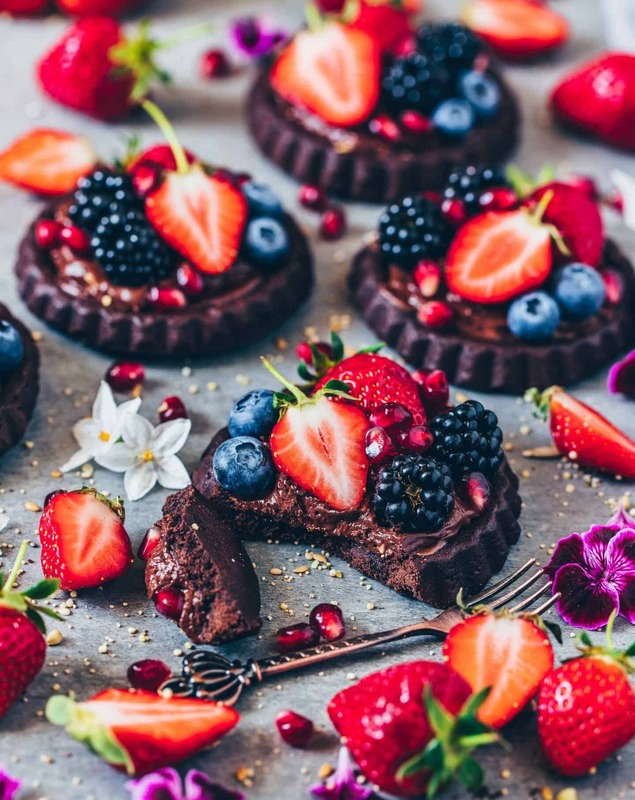 Perhaps, you’ll be able to buy all the ingredients for these delicious chocolate tartlets today. I think they would be a perfect dessert for Sunday? 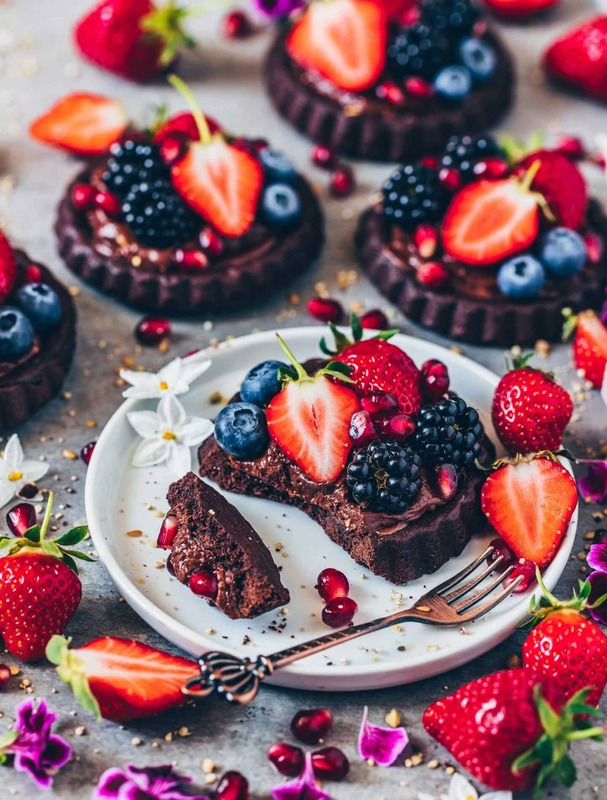 Because you know, chocolate is well known to make happy and the berry season is unfortunately over faster than you think! So you should definitely make the most of this time of year! 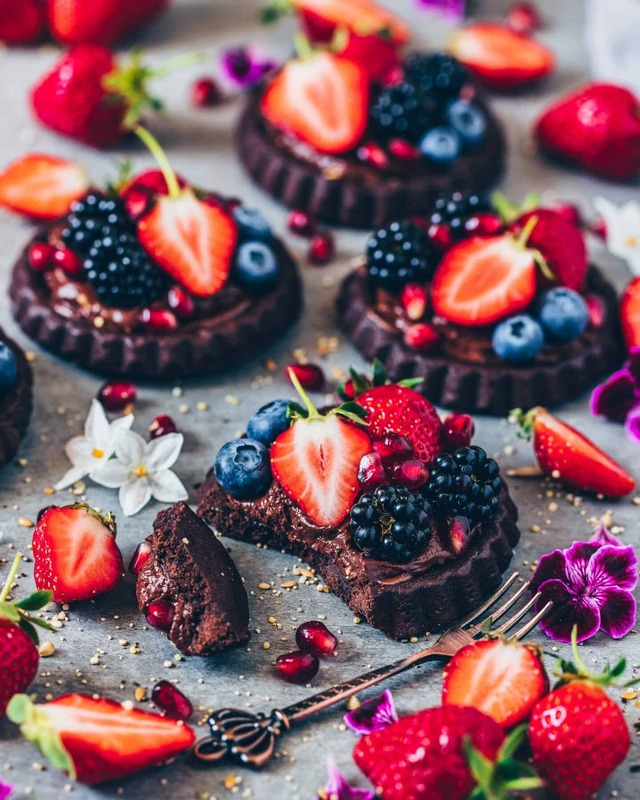 If you try the recipe, I’d love to know what your favorite berries are, or if you prefer to eat these tarts even without any berries. You are also welcome to post a picture on Instagram and link it to @biancazapatka so that I can see your wonderful creations. ? 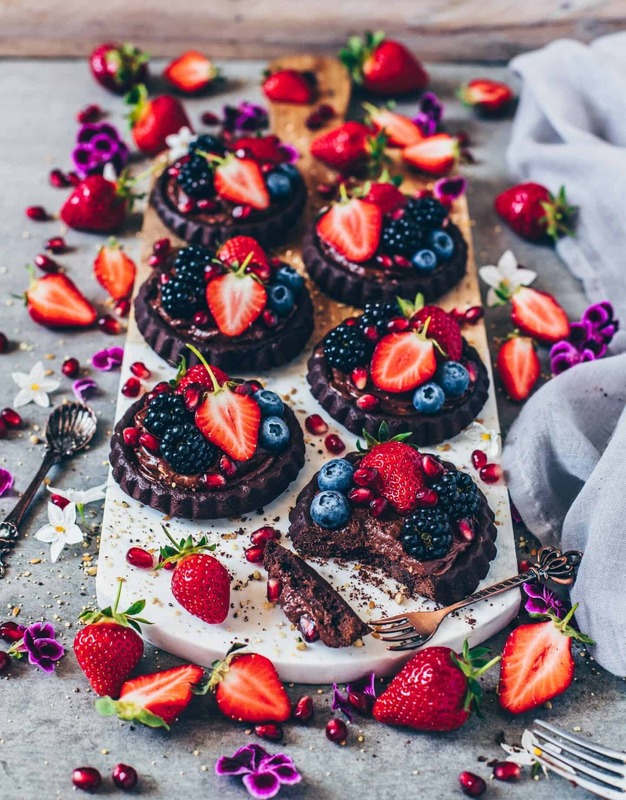 Vegan chocolate tartlets with creamy, healthy avocado-chocolate pudding and fresh berries. 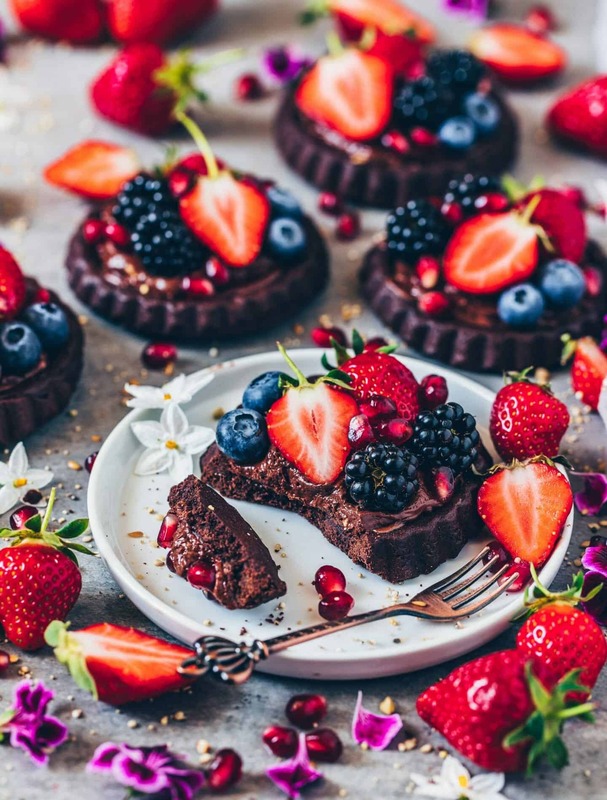 A perfect recipe for all chocolate and berry lovers. Especially when the tarts come fresh chilled out of the fridge, it's a great summer dessert. First mix the flour, salt and powdered sugar. Add cold vegan butter in small pieces and knead briefly until a crumbly dough is formed. Add a little bit of cold soy milk (or water) and bring together to form a smooth dough. Form into a ball, wrap in clingfilm and leave to chill for 30 minutes in the fridge. Then remove the dough from the fridge, roll out thinly and let rest for another 10 minutes. In the meantime, preheat the oven to 180°C and grease the tartlets molds. Cut out the rolled dough in circles to fit your tart tins. Trim off any excess dough. Pierce the base several times with a fork so that the dough does not rise. Bake for 15 minutes in the oven. After baking time, allow the tartlets to cool. Halve the avocados, remove the core and spoon the pulp into a huge container (or food processor). Add the banana and blend. 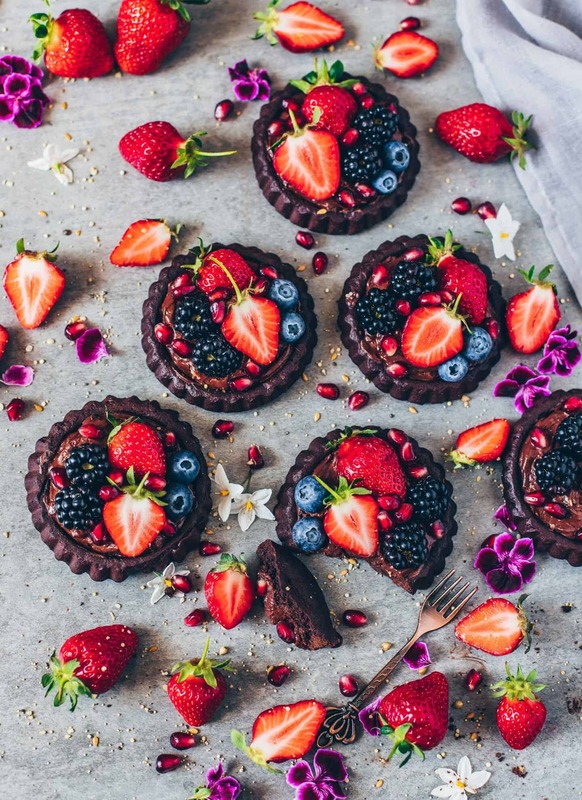 Spread the avocado chocolate cream on the tarts and store in the fridge until serving. Garnish with berries (or other fruits / toppings of choice) before serving. If there’s something left over from the pudding, you can enjoy it (with the remaining berries). It tastes super delicious even without the tartlets crust. Instead of spelt flour you can also use wheat flour. Instead of agave syrup you can also choose other sweetness of choice and to taste, such as maple syrup or rice syrup. Ahhh these little tarts are so tempting ? They look like the perfect Sunday treat, I might go and buy vegan margarine today since I already have all the other ingredients hehe. Thank you for sharing the recipe! 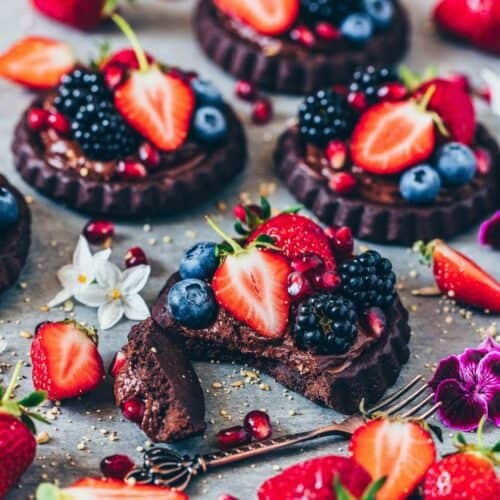 I hope you‘ll like these tarts. This is a fantastic food recipe, thank you for the brilliant write up. Can’t wait to try it.